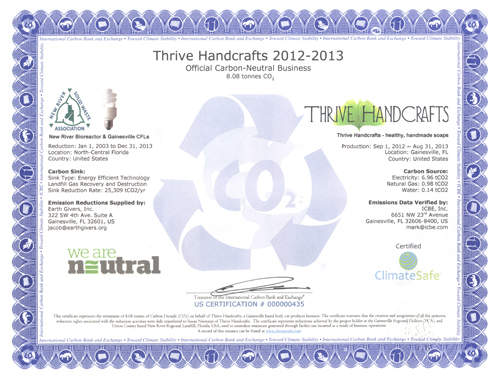 Thrive Handcrafts is a Gainesville based body care products business. Thrive items are vegan and all are vegetarian – the only animal products are milk, silk, beeswax, and honey. Thrive uses essential oils for fragrance and flavor, and natural ingredients such as herbs, coffee, tea, oatmeal, and clay for color. ClimateSafe ® is the United States' first federally recognized certification mark for greenhouse gas neutral products and services. The ClimateSafe Certification guarantees that a product, service or event is actually Carbon Neutral.